A fence-mending deal signed this month by Somalia and Puntland has variously been hailed as a blueprint for stability and state-building in the wake of decades of civil war, and dismissed as a recipe for renewed inter-clan violence. The 14 October agreement between the Mogadishu-based Federal Government of Somalia (FGS) and the autonomous Puntland State covers issues including bilateral relations, contentious political boundaries and national security. The self-declared independent republic of Somaliland, which lies to the west of Puntland, said it felt threatened by the prospect of the new joint military force outlined in the agreement. Nuur Mohamud Sheekh, senior political adviser at IGAD, a grouping of regional states, explained the broader importance of the deal. “The major significance is that it normalizes the relations between the FGS and Puntland. Prior to this, relations were at an all-time low and characterized by suspicion, especially after the Mogadishu government supported the formation of the Central State,” he told IRIN. 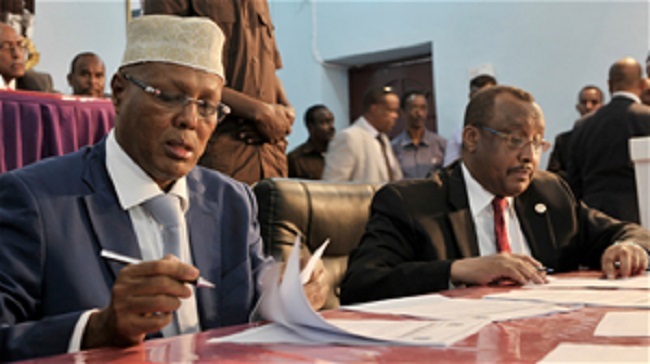 Some leaders from the emerging Central Regions State disagreed, reacting to the agreement with outrage, mainly because it reinforces the division of the Mudug Region along clan lines. “This agreement goes against the provisional constitution of Somalia that clearly states that federal member states can only be formed through the amalgamation of two or more [whole] regions that existed prior to the  downfall of Somalia’s last central government,” said Hassan Mohamud Hayl, speaker of parliament in Galmudug, one of the constituent areas of Central Regions State. “This agreement will revive conflict and set the population of Mudug against each other and this has to stop,” he told IRIN. “Federalism should be based on geography and not clan considerations,” he told IRIN, adding that the deal might encourage leaders in other emerging federal member states to encroach on neighbouring states on the grounds that certain clans predominated there. “I doubt if this agreement will go anywhere because it is unconstitutional. Also the national commission for federalism and border demarcation has not yet been formed,” Abdikadir Suleiman Mohamed pointed out. “The UN mission in Somalia, the SFG, IGAD, the EU and other donors are now hooked into a continuing cycle of local, partial deals, all to meet a series of external deadlines that have never produced good politics in Somalia,” he added. “As a government, we are closely following the situation as it unfolds and we will respond accordingly to any attempt at interference,” said Mohamed Osman Dube, the administrative director of Somaliland’s Ministry of Interior. Dube said Mogadishu “was already involved in anti-Somaliland activities” notably in the Sool region, parts of which are claimed by both Somaliland and Puntland. “The region is particularly prone to conflict, given the competing claims by Somaliland, Puntland and Khatumo over oil-rich territory there and political infighting among the Dhulbahante, who are divided in loyalty between Puntland, Khatumo and Somaliland,” the report said. “This state of affairs has led to the militarization of the area, in particular since November 2013, and links in some cases to [jihadist insurgency] Al-Shabaab and in others to the Federal Government,” it added. Oil exploration licences in and near the Sool region have been issued by authorities in Somaliland, Puntland and Somalia – in some cases for the same blocs. “When it comes to oil and gas, Somaliland will feel threatened [by the agreement]: If Puntland is swearing allegiance to Mogadishu, it is more likely to accept federal government fiats over oil licences in greater Somalia, even if they have signed their own licences,” explained a regional political analyst who requested anonymity. Somaliland is currently developing an Oil Protection Unit ostensibly to provide security to firms conducting seismic surveys. Concerns have been raised about the unit’s potential to destabilize the oil-rich areas. The regional analyst stressed that the 14 October deal needed to be complemented by efforts to improve governance. If left unaddressed, “corruption, mismanagement, secret deals and the capture of public assets by narrow cliques in both Mogadishu and Puntland threaten to undermine any progress in state-building,” he said. “The issue of corruption is key and donors are heading to make a big mistake if they ignore it,” he said, noting that not only was there no agreement over the sharing of state resources between Puntland and the FGS, but that there was little transparency over the value of their respective oil deals, port revenue and other public goods. According to the Monitoring Group, the “systematic misappropriation, embezzlement and outright theft of public resources had [years ago] essentially become a system of governance” and had in some areas, such as “secret contracting” worsened since the 2012 installation of the internationally-supported and bankrolled FGS. The argument that “a degree of diversion is inevitable or even acceptable as part of the State-formation process and the exercise of power under the prevailing conditions… is not only inconsistent with the scale of irregular financial flows, but also disregards the importance of corruption to the chronic insecurity of Somalia,” it said.